We held our first barista championship at the end of 2017. This exciting competition consisted of two heats and a final. Competitors from across our business battled it out to become bartlett mitchell’s leading barista. 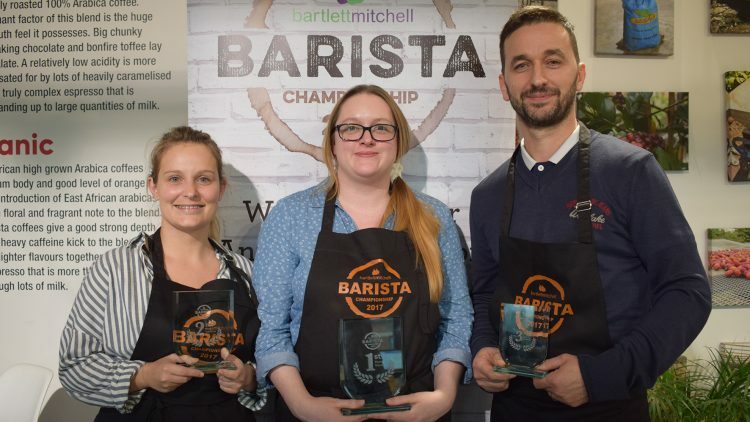 In the end, Laura Floyd saw off stiff competition from six other finalists and was crowned ‘Barista Champion 2017’. Other awards were given for best customer service, best espresso, best cappuccino and best signature drink. To assess a broad spectrum of barista skills the competition was structured in three stages: an espresso course, a cappuccino course, and a freestyle course that allowed competitors to present a signature drink to the judges. The baristas were assessed on their coffee knowledge, grinding skills, coffee machine use and milk preparation techniques. The Barista championship was developed by our coffee brand manager, Miguel Camara and strengthens our commitment to refining our coffee offer, adding to the significant resource already invested in service training and development. Wendy Bartlett, executive chairman, said: “We are really pleased with our first championships. We’ve seen some fantastic talent and we’re incredibly proud of all our finalists, and competitors in the previous heats. The standard was very high, which is testament to Miguel Camara, our coffee brand manager’s drive and leadership which inspired our baristas to enter the competition. Coffee is a fundamental part of our growth strategy and the championships play an important role in helping to recognise and develop the people who are delivering it.” Wendy added: “Laura was fantastic. She demonstrated a great level of engagement with the judges, explaining her drink and where it came from. Laura also won best espresso, which is the essential building block to a good coffee based drink”.